OPEN COCKPIT FLYING A flying lesson in a de Havilland Tiger Moth takes you back to the golden age of British bi-plane flying. 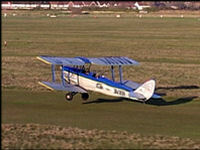 In your leather flying jacket and Biggles white silk scarf, survey the magnificent countryside from the open cockpit! 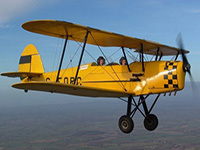 Imagine yourself in the first years of aviation and the thrill of a wartime fighter pilot taking his first training flight in this nostalgic aircraft. Remember The English Patient? Remember Biggles? 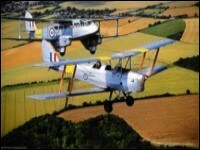 Then no doubt you will remember the Tiger Moth. 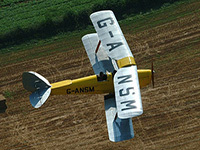 Most Tiger Moths in Britain are privately owned so the chance of a spin in one is relatively rare. Donning the leather flying jacket, goggles and helmet ready for a flight of pure nostalgia, and its high above the bustle of modern life it is easy to imagine it is 1934 again. 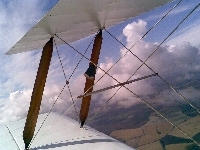 What a great chance to experience flying the quintessential British bi-plane. 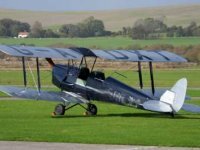 For 2018: We are pleased to bring back our FREE pilots' notes offer with every vintage biplane experience. These fascinating documents are reprints of the War Ministry documents issued to RAF student pilots from the 1930's, stuffed full of cockpit photos, engineering diagrams and handling tips. "Go and read this book from cover to cover, yew 'orrible little man". cannot post the booklet if you opt for your voucher to be delivered by email.